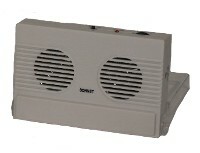 AM/FM Radio with Weather Band. 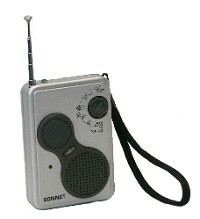 Great for emergency or listening for weather in your area. LED light, Rod antenna, carrying strap and power light. Uses 2 ''AAA'' batteries (not included). Latest design with double adjustable headband to stay on your head securely. Silver color. Short whip antenna. Full size adjustment. Uses 2 ''AA'' batteries (not included). 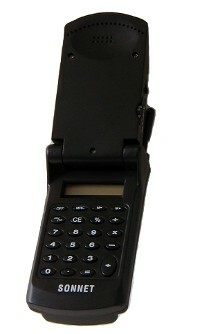 Folds up to look like flip open cellular phone. Swings open to reveal the eight digit LCD display calculator. Powerful AM/FM radio, too. Headphone jack. See-thru blue color. 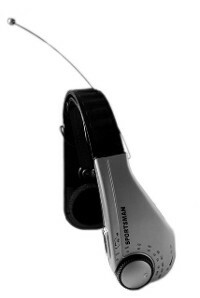 Listen to your portable audio device just as you would on a portable radio through two speakers. Internal storage for cord to plug into the headphone jack on your device. See through lid swings open to form a stand to hold the speakers upright and folds up to fit into your pocket. Uses two ''AA'' batteries (not included). White with black trim.